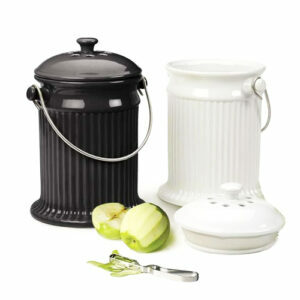 Our Deluxe Stoneware Compost Pail can sit handsomely on your counter top while collecting fruit and vegetable scraps. 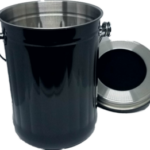 This earth-friendly compost pail makes natural recycling trouble-free. It’s the just the thing answer for the trouble-free recycling of kitchen food scraps, like coffee grinds, fruit and vegetable peels, and much more! Then you just carry the pail to your worm composter and create an unlimited supply of free organic fertilizer! 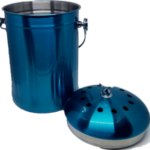 The Pail holds several days worth of vegetable trimmings and food scraps, while two charcoal filters in the vented lid ensure an odor-free environment. This container looks great on my kitchen counter. Holds nearly weeks produce scraps without an odor and no fruit flies or gnats. 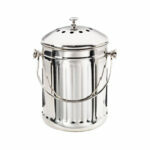 I love this compost pail! It’s perfect! This pail sits on my counter with zero stink, has easy access, and is just too cute for words ! So far OK. Looks good and eliminates usual compost odor. My only concern is that its ceramic and will it chip or crack after moderate use. Other that that it's a great deal for the money. 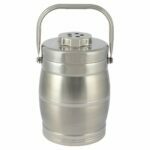 Next time I will probably go for the Stainless steel model. I bought a Black Ceramic Compost Pail for my kitchen. It is working out great. I like putting coffee grounds and egg shells in my garden, but they were always sitting in bowls in my kitchen. With the cute pail, my family can store these things out of sight.